The intreXis Boardnet Converter Platform is a new definition of high-performance DC-DC converters. With its ultra-wide input voltage range of 14.4VDC-154VDC and highest efficiency, the new intreXis converter generation sets a new benchmark for DC-DC converters. The ultra-wide input voltage range allows the use of these DC-DC converters in railway applications with all nominal input voltages (24V, 36V, 48V, 72V, 110V), without changing the configuration. The full power is available throughout the temperature range class TX, from -40°C-85°C according to EN50155, without derating or a fan. The outstanding Boardnet Converter Platform DC-DC Converters are available with a broad range of output power versions from 75, 150, 300 up to 500W. 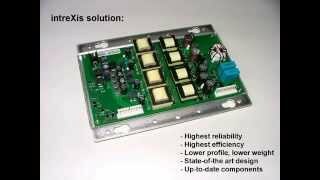 intreXis AG has designed a new and innovative High Input Voltage Power Supply. The design of the converter is based on an innovative concept with Silicon-Carbide Semiconductors. High voltage power-supplies powered by the contact-line experience high energy surges, which cannot be absorbed with traditional techniques like varistors or transzorbs. An innovative, active surge-limiter with outstanding advantages is also implemented in the converter. As a result, this technology is optimally suited to be used as flat battery start units which are powered directly by the contact-line. The railway-standard EN50155 distinguishes the temperature classes T1 (-25°C .. +70°C), T2 (-40°C .. +70°C), T3 (-25°C .. +85°C) and TX (-40°C .. +85°C). However, in many regions of the world it can get colder than -40°C. For instance, in Russia, temperatures down to -50°C are often expected. intreXis has invested a lot in research for the proper functioning of the power supplies – and hence the whole locomotive – at these extreme temperatures: intreXis has designed a family of converters, which operates over the entire temperature range from -50°C .. +85°C without any restrictions. intreXis is one of the leading custom power supply unit designers and manufacturers of high efficiency and high power density power solutions for a variety of markets including Transportation, Industrial, Automation, Medical, Datacom and Telecom. When your system power needs cannot be addressed by Standard products, then intreXis can utilise its world class power design capability to realise an optimal solution, customised to your specific requirements giving you a custom power supply unit. Our low risk approach leverages proven technology platforms and building blocks to ensure that we meet cost and performance specifications without compromising the time-to-market for your own product launch. Our people and processes are set-up to act as an extension of your internal resources, working as your trusted and expert partner at all stages of the project, refining the power specifications in order to ensure optimal cost / performance trade-offs, eliminating potential ambiguities and highlighting any areas of risk associated with your project. intreXis AG has extensive experience in the design of DC-DC converters according to the Railway standard EN50155 and have already developed many power supplies for railway applications. The Railway Standard EN50155 defines temperature ranges (class T1, T2, T3 and TX), Input voltage ranges which can vary in the range 0.6 UN and 1.4 UN and multiple other standards, for example, Vibration EN 61373, EMC EN50121-3-2, and isolation coordination EN50124. Ask intreXis Engineers for guidance through the jungle!